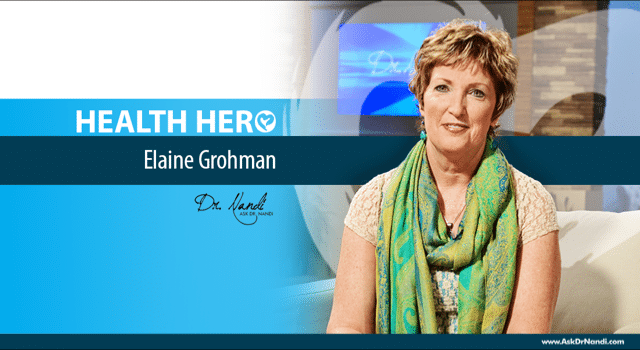 Elaine Grohman is a friend to the Ask Dr. Nandi show and she is also a certified Healing Touch Practitioner. Elaine is also our latest Health Hero. Elaine Grohman has always felt and seen energy her whole life and she always felt that this is something that the whole world does as well. When she was a young girl, she was able to see the energy coming from the trees she was looking at. As she got older, she was able to see it from all living creatures because she believes that energy is all around us and that we all have the ability to see it. Her first experience with energy and touch was with an aunt who was in the final stages of passing away from diabetes. Elaine was holding her aunt’s hand who was in a coma. As she continued to hold her hand, her aunt woke up and with a smile spoke of her sister who said to come to her. This sister was Elaine’s mother who had passed away many years ago. Elaine told her aunt that she would be well-taken care and that is was okay to go. Elaine was able to help her aunt with just her touch. Elaine practices healing touch but she also believes in bringing the practice to the forefront. She has a wonderful belief that what we call humanity means love. That love is an energy and that energy is the healing force. Elaine has found that what affects the energy of the body has the ability to affect physical health as well. Her practice involves teaching others to heal with energy., how to send energy to the area that needs it the most. Elaine has made it her mission to spread the message that the mind and energy can also be a healer. Watch as Elaine shares how she became a healer in the Ask Dr. Nandi episode “Medical Miracles” below. To learn more about Elaine, visit her website at ElaineGrohman.com.